This is a guest post by Alex Jironkin (@biocomputerist) in the core bioinformatics group at Colindale. Take a look at the documentation for nanopore tools, it has plenty of examples. At first glance it doesn’t look great, lots of mismatches everywhere, but you can see features in nanopore reads that correspond to your contigs. It’s ok we are not calling SNPs on this data so it doesn’t matter. We can, however, use the amazing read length to help us resolve the problematic areas that Illumina reads just don’t reach. In other words, we can scaffold our Illumina assemblies with long read length from nanopore. This way you get the confidence of the consensus sequence from short reads and longer contigs. SSPace can scaffold your assemblies, but some assembler will accept long read data to do the scaffolding for you, e.g. Spades (version >3.1.1). We are getting better, but still nothing to be excited about. In fact, I started to get a feeling that something was wrong with the assemblies. I used 11 kmers because longer kmers should improve repeats in the assemblies, but maybe they are somehow interfering instead of helping? I decided to drop the kmer count to 5 instead of 11. N50 for scaffolds with nanopore have increased by 5 almost 5 times, our contigs are much longer and there are 3 times fewer of them, length of the longest contig doubled.. It seems longer kmers somehow interfering with the assembly and mapping back to the 11 kmer assembly I started to see some weird results, which made me think those started to be misassemblies and not real. I have tried scaffolding with 1D (forward and reverse treated separately) 2D (two-directional reads) and 3D (two directional, forward and reverse) reads. The summary is here. 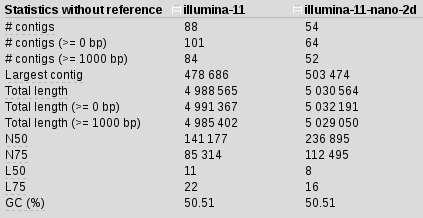 Our best result was still illumina-5-nanopre-2d. P.S> There are lots of optimisation that can be done here, but we got what we wanted from this dataset, and so there was no need for us to do them. You can drop kmer to 4 and get 1Mb contigs, and so on.